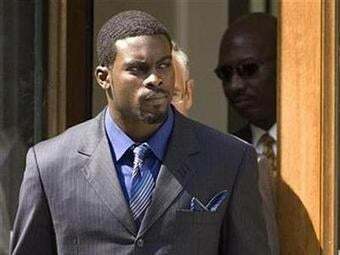 Michael Vick Escapes From Prison! Convicted dog murderer Michael Vick snuck out of the federal penitentiary in Leavenworth under the cover of darkness this morning, completely undetected by the media. How does he do it?! Vick and his jailers somehow managed to avoid a circus-like former perp walk and endless loops of news footage of his first moments as a (sorta) free man. He technically still has two months left on his sentence and will serve them in home confinement, only leaving his pad to go his $10 construction job (the man needs a union) and church and stuff. Then in July he begins his 3-year-confinement. But the neverending "will he or won't he ever play football again" debates have already begun. Drew Sharp, for one, has decided that Vick has not learned his lesson and needs to be punished some more. And before you get all Leonard Little on him, Drew is way ahead of you. Vick is mean, but Little was just stupid. Ok, but what about say ... Jamal Lewis, who was accused of dealing drugs. He went to prison and missed less than half a season. Do you think he came into possession of "a new moral compass" during his four week NFL vacation? Or to put it more bluntly—as bad as his crime was, is he really the worst person playing professional football?